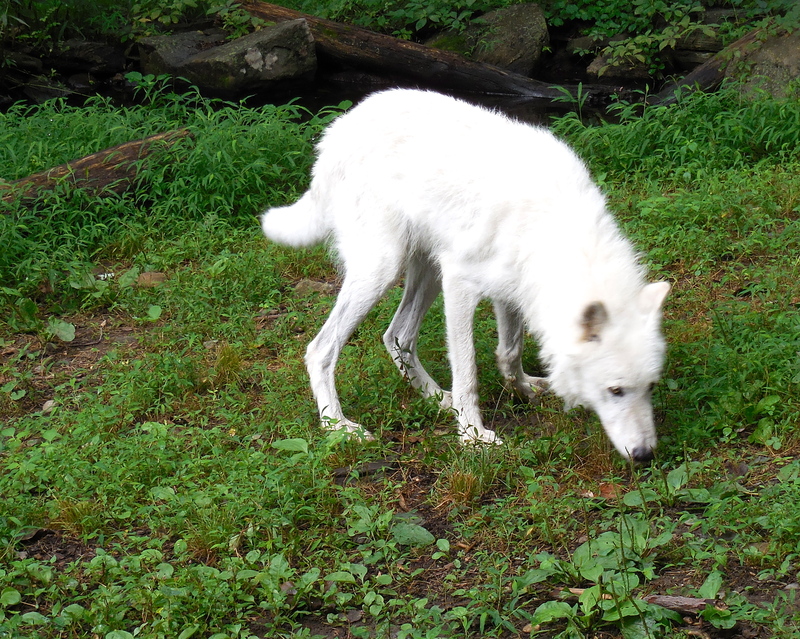 HOWEVER, Jax may have to share my affections with a couple of new “canines.” Specifically: Zephyr, Alawa, Atka and Nikai – the North American Wolves that I met during my visit to the Wolf Conservation Center in Salem, NY. Access to the Center is by invitation only, so my entry was as a member of the American Museum of Natural History, which organizes many unique events – including behind the scenes explorations of the museum’s prize collections and exhibitions – more about that in a later post. 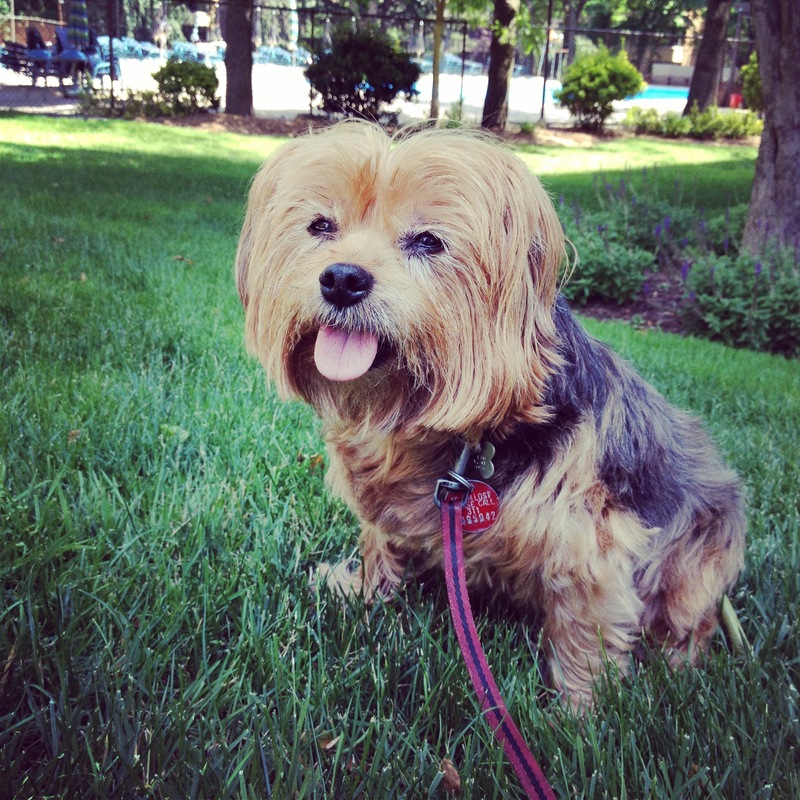 The day began early, as I had to drive to the Museum for a 9AM coach departure and the traverse across the island of Manhattan can be quite tricky, as was the case Saturday as many major thoroughfares were blocked off for marathon races and food festivals. Here is where being a bit OCD comes in handy as I gave myself a wide berth of time to make an otherwise 45 minute drive. I arrived, as is my nature with a good 30 minutes to spare. My friend, who lives in Connecticut, however had decided to be “safe” by taking public transportation including the subway which has a stop right at the Museum’s entrance. Au contraire – upon arriving at the Museum I received texts informing me that her first train had broken down, another train had to be summoned to take the first train’s passengers, they were then delayed getting into Grand Central Station, she was taking the shuttle crosstown and finally she was getting into the subway line to the Museum. Lenore arrived just as we were starting to board the bus. As in many previous posts: WTDGAP! As Lenore has been a participant in a number of these misdirections – she had a good laugh this time and told me that all through the travails of getting to the museum she had thought to herself: “I bet Cindy could write a blog post about this.” My friends know me well. All aboard the coach! 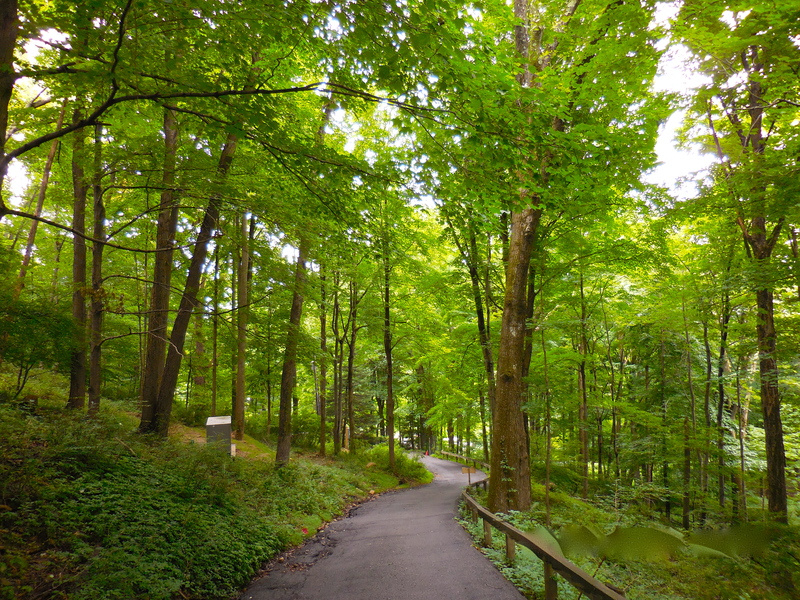 The Fates must have felt pity for us, for the weather which had been forecast as thunderstorms and rain showers had managed to transform into overcast but dry – perfect for the hike through the forest up to where the Wolf Conservation Center is located. 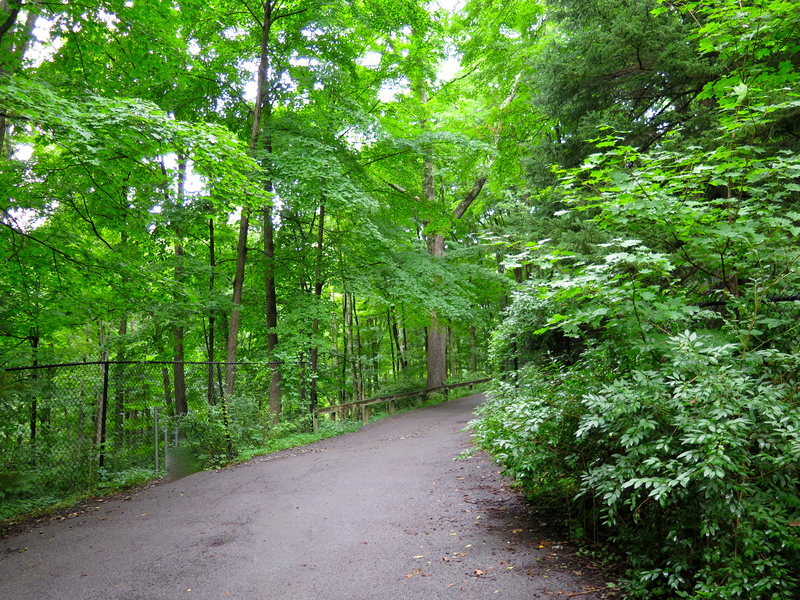 I should mention that the hike was STRAIGHT UPHILL on slippery, muddy trails – while we are both in decent physical condition, our hearts were pounding when we reached the summit entrance to the Center. 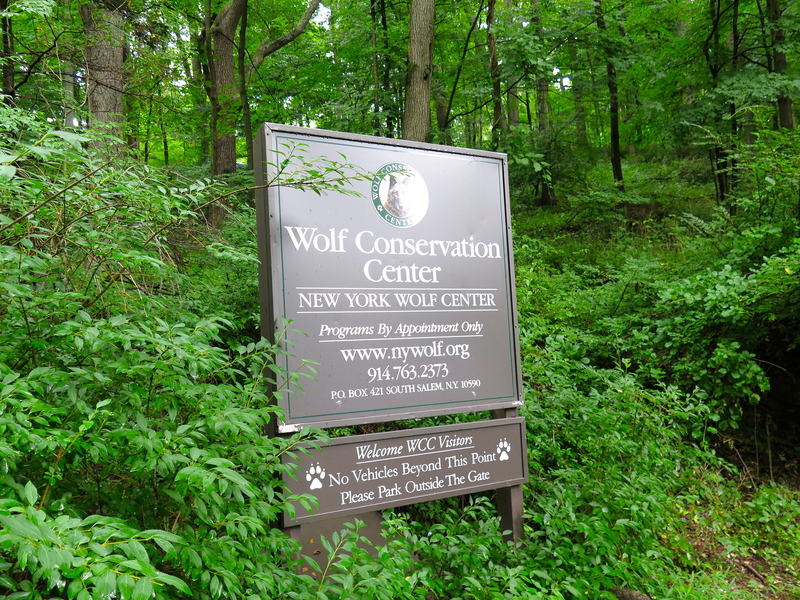 The Wolf Conservation Center (WCC), founded in 1999 by Hélène Grimaud, is a private, not-for-profit environmental education organization located in South Salem, NY. 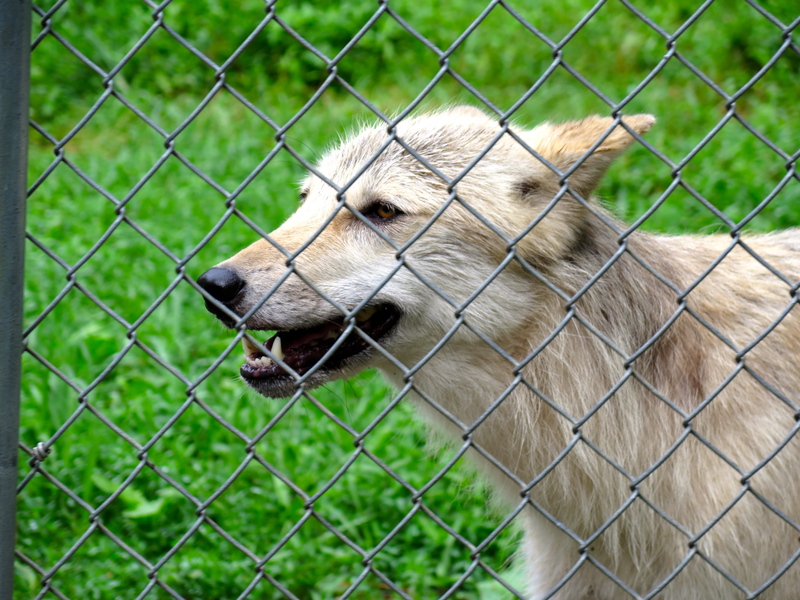 The WCC’s mission is to promote wolf conservation by teaching about wolves, their relationship to the environment, and the human role in protecting their future. 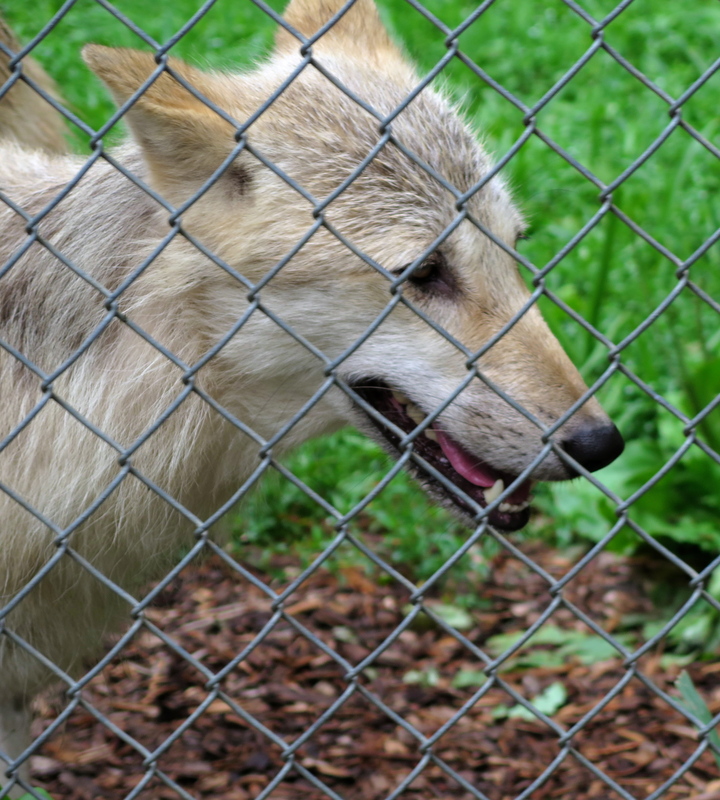 The WCC accomplishes this mission through on site and offsite education programs emphasizing wolf biology, the ecological benefits of wolves and other large predators, and the current status of wolf recovery in the United States. 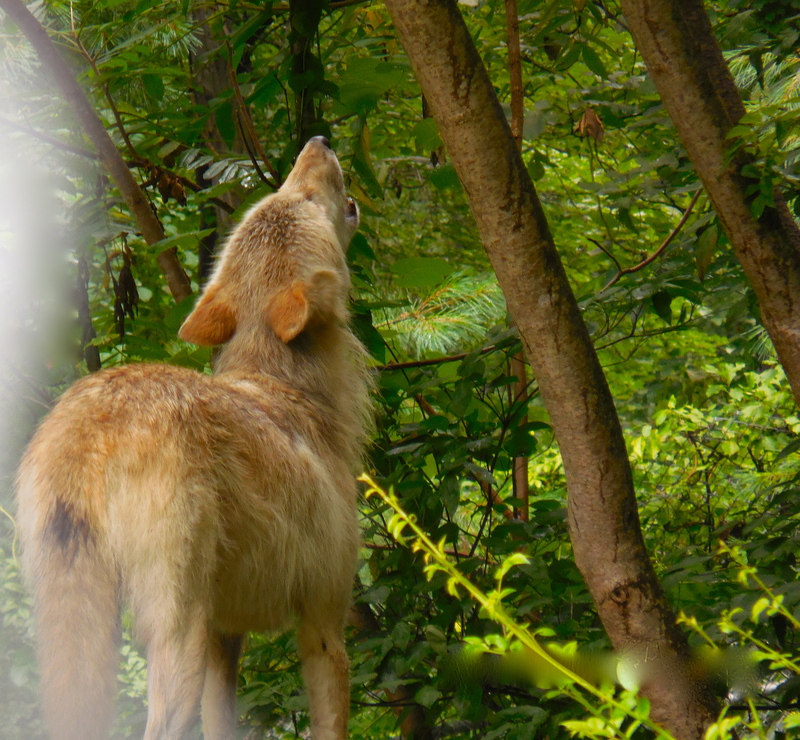 The WCC also participates in the Species Survival Plan (SSP) and Recovery Plan for two critically endangered wolf species, the Mexican gray wolf (Canis lupus baileyi) and the red wolf (Canis rufus). The Mexican gray wolf and the red wolf are among the rarest mammals in North America, both species at one time were completely extinct in the wild. Presently there are approximately 400 Mexican gray wolves and 300 red wolves remaining in the world, the majority living within the network of facilities like the WCC participating in the SSP. Every one of these endangered wolves in captivity is a part of something bigger than their pack and the facilities that house them. 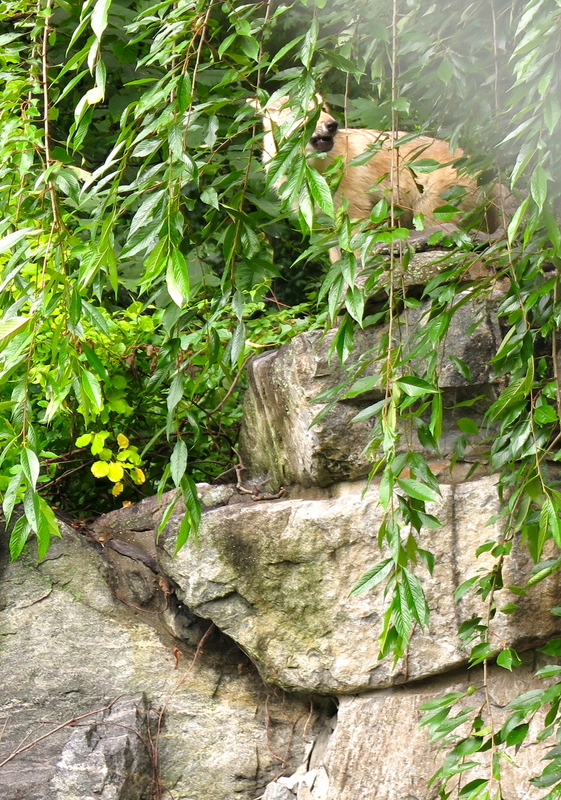 These special canids are integral parts of the recovery of their rare species. 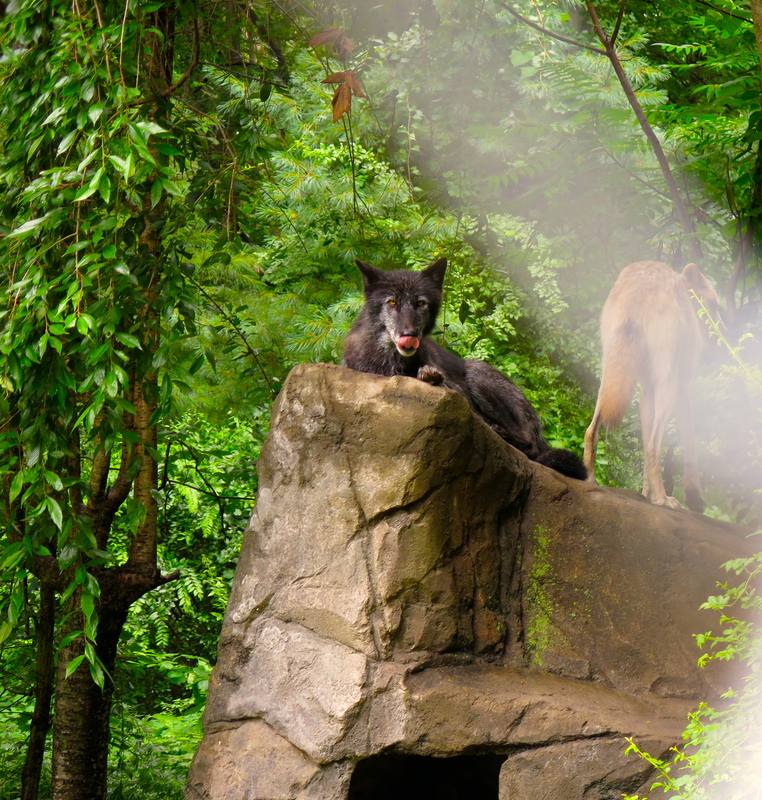 Many of these wolves contribute as ambassadors, living on view at a variety of zoos throughout the United States to help people learn about the importance of their wild counterparts. 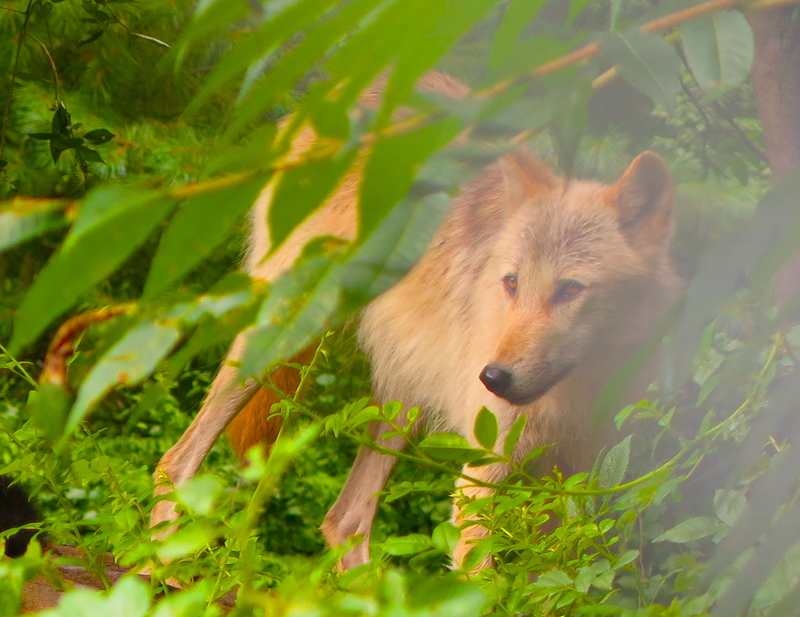 The WCC’s 2 SSP exhibits offers visitors to the Center an opportunity to behold these species and our 8 WildEarthTV webcams extend 4 wolf families to a global audience. 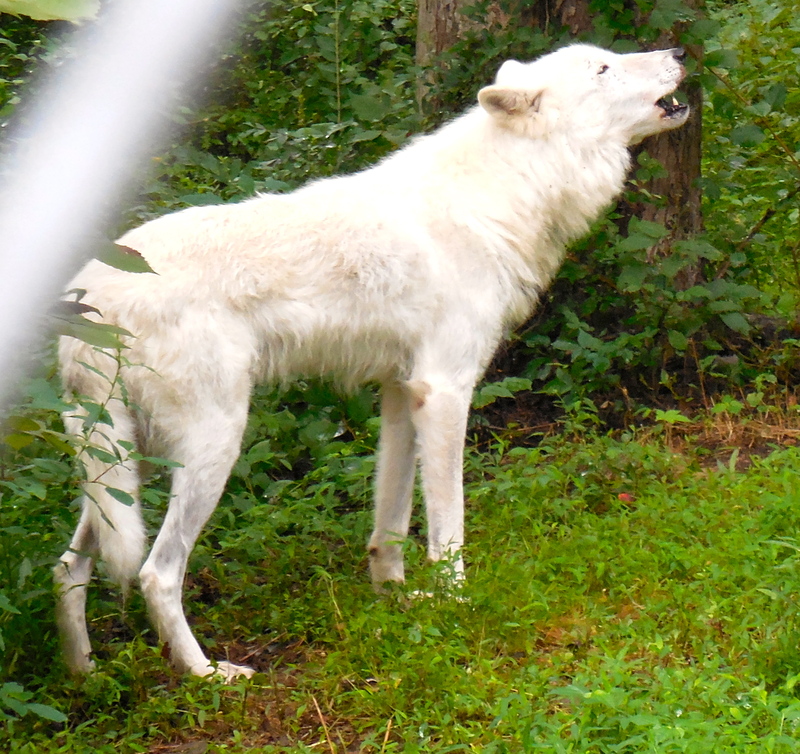 Some of these education wolves can also contribute to the revitalization of their species more directly as participants of the SSP Wolf Captive Breeding program. 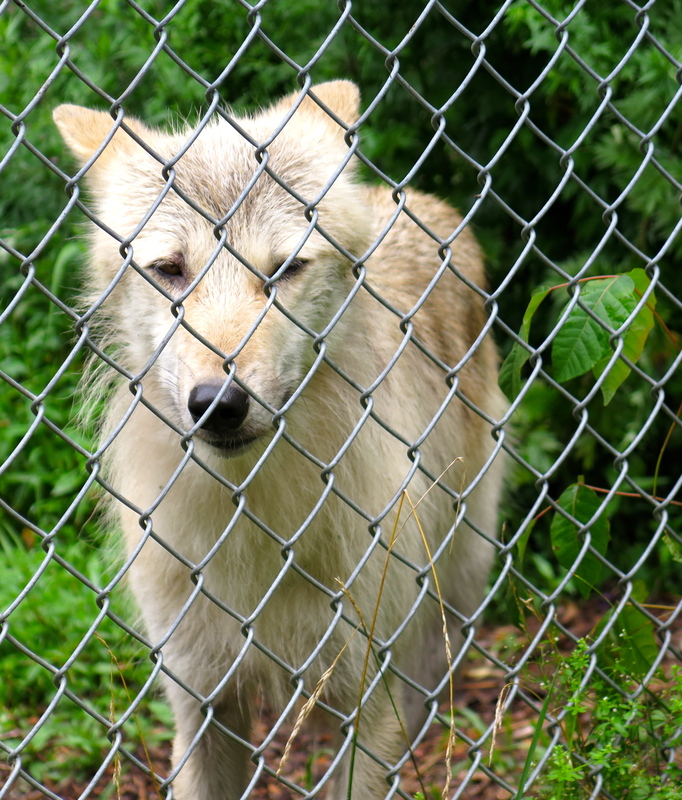 A special faction of captive wolves, however, can have the most direct impact on the conservation of their species as well as their ancestral habitat in the wilds of North America. 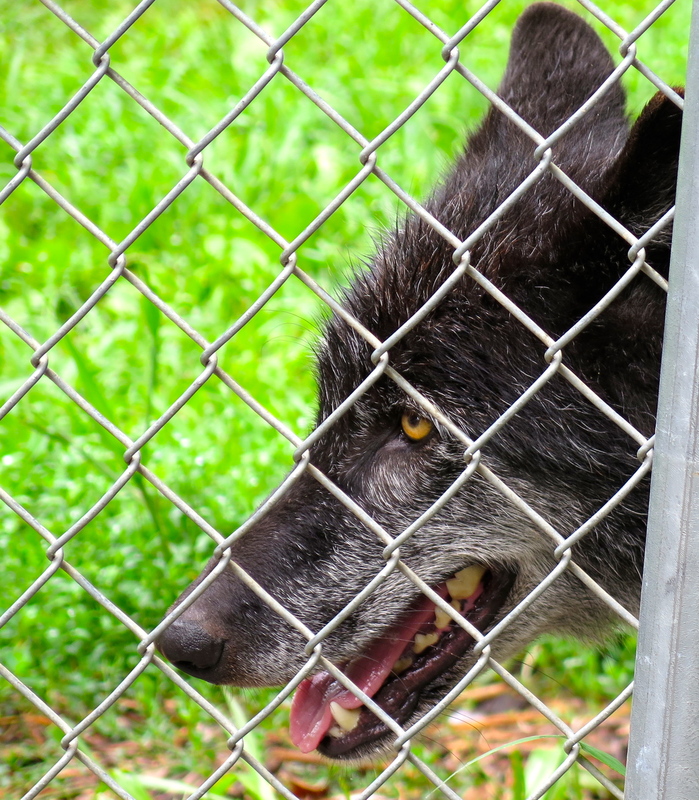 These wolves are candidates for release into the wild. The U.S. Fish and Wildlife Service (USFWS), under the Endangered Species Act, is re-introducing Mexican gray wolves and red wolves to portions of their historic range, and 2 wolves from the WCC have been given this greatest opportunity – a chance to bring an ecosystem back to balance. 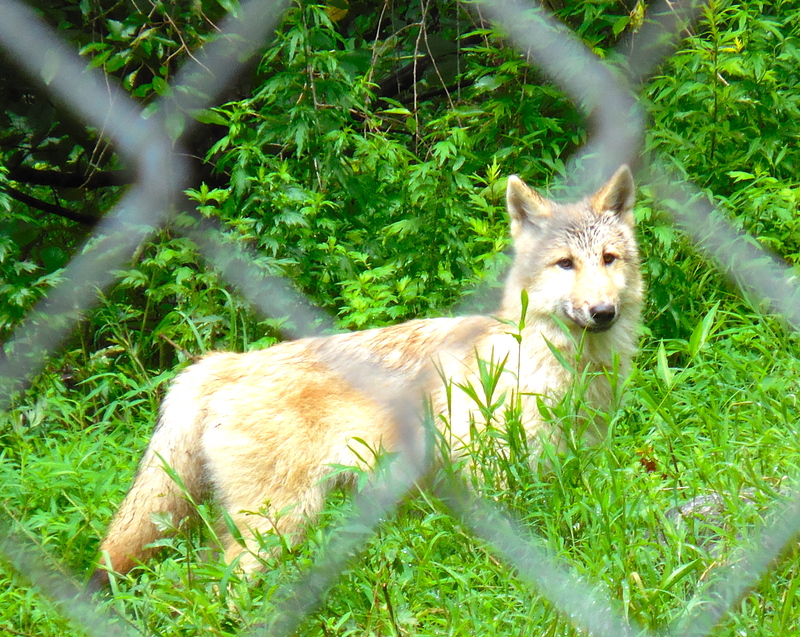 Looking forward, the WCC aims to become the pre-eminent facility in the Eastern United States for the captive breeding and pre-release of endangered canid species, and to continue expanding our education and outreach programs to communities far beyond the gates of our facility. As any student of ecology knows, all earth’s flora and fauna work in this miraculous cycle that is, as aptly put in The Lion King: “…the path unwinding, the Circle of Life.” There is an intricate relationship and balance that is so delicate that any interference can wreak havoc. For example, our guide, Maggie Howell, Executive Director of the Center, explained how the systematic destruction of the grey wolf from Yellowstone National Park, which is located in parts of Wyoming, Idaho and Montana has caused a critical ecological imbalance. From 1872, when the park was founded, until the 1920’s, the gray wolf was an integral part of Yellowstone eco-system. But, by 1926, the U.S. Government had eliminated all the wolves. As a result, the Park’s “prey” population which had been kept in check by the wolves who effectively culled the weaker elk, bison and deer for their food, ran amuck. Since there were no predators, these animals had no need to constantly move from grazing area to grazing area to avoid detection. 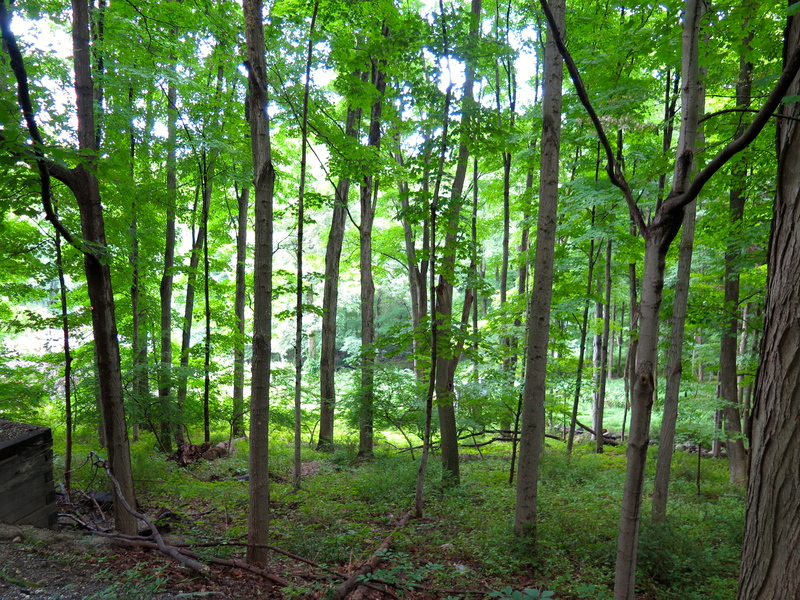 Instead, they set up shop in one place and effectively ate all the vegetation down to the nubs. There was no opportunity for renewed growth and thus the fields were decimated, leaving less food for the herds. I would also surmise, though I don’t have the data at hand, that the herds themselves became disadvantaged as the lack of the “survival of the fittest” might have led to less healthy herds which in turn might be more prone to disease or be less likely to survive inclement weather. In 1973 the Endangered Species Act was passed, and the process of reintroducing the grey wold into the area began. 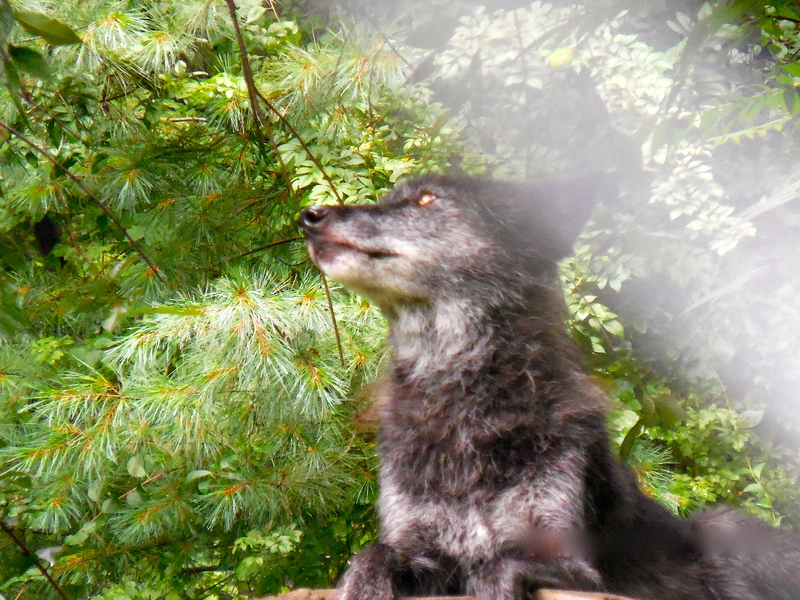 ZEPHYR (Greek God of the West Wind) – is a 3-year-old black male whose lineage is primarily Canadian/Rocky Mountain gray wolf. As you can see from the smile on his face he is a spirited guy and he easily won us over with his rather high-pitched howl. NIKAI (“little saint,” “one who wanders”) – at 4 months of age has already grown leaps and bounds from that little ball of fur shown in the first picture (which is from the Wolf Conservation Center website). This guy is a bit shy among humans but loves to play around with Zephyr and Alawa, who allow Nikai liberties, letting him pull at their legs, tails and ears and generally behave like the youngest member of any family. All three joined in a lovely chorus of welcome to us as you can hear and see in the video posted at the top of this story. 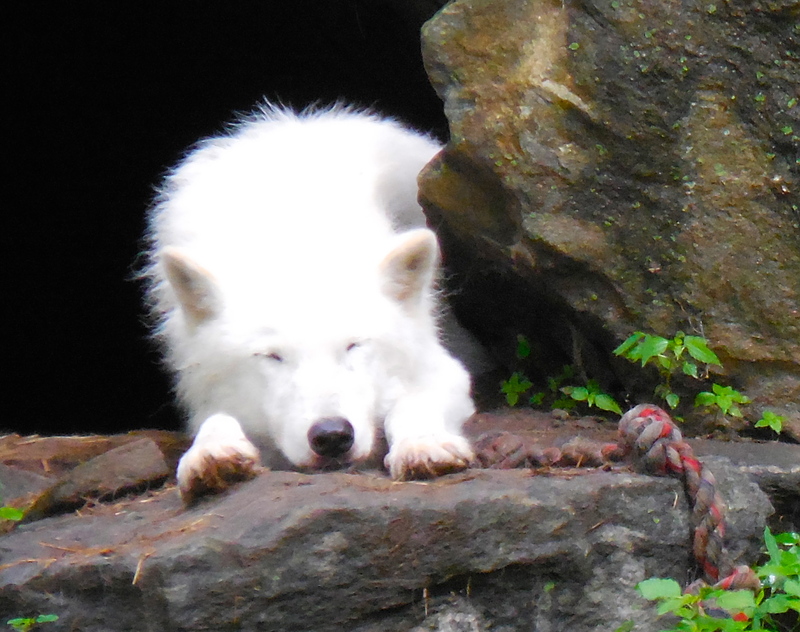 ATKA – The elder statesman of the Ambassador Pack, Atka is now 12 years old and originally came from Minnesota. Atka actually had a German Shepherd Nanny named Eno, who sadly passed away a few years ago. 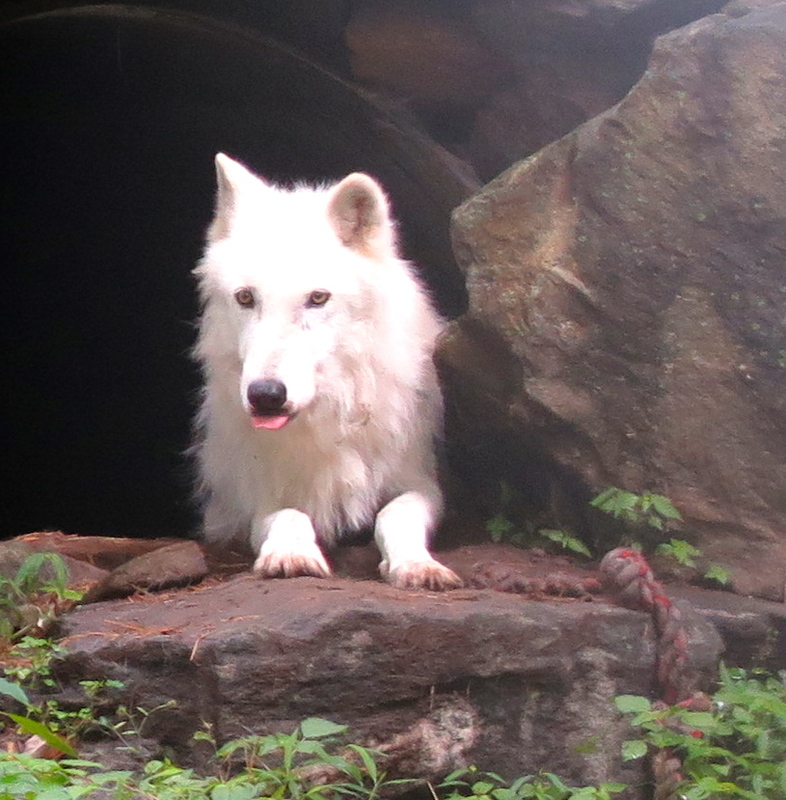 Atka is considered the best “wolf teacher” and loves to travel, visiting schools, libraries and museums to help teach people about his wild cousins and their critically needed contributions to nature’s balance. This was a unique experience that I highly recommend – you do have to make an appointment for a visit – but you will come away with a great affection and appreciation for these beautiful wolves – and perhaps a resolve to do something to ensure their future in the wild. This entry was tagged AMERICAN MUSEUM OF NATURAL HISTORY, ARTIC WOLF, EXTINCT, GREY WOLF, HABITAT, HOWL, MEXICAN WOLF, RED WOLF, TERRITORY, WHITE WOLF, WOLF, WOLF CONSERVATION CENTER, YELLOWSTONE NATIONAL PARK. Bookmark the permalink.